Harlequin bugs are ruining my Cleome (Spider Flower) plants. 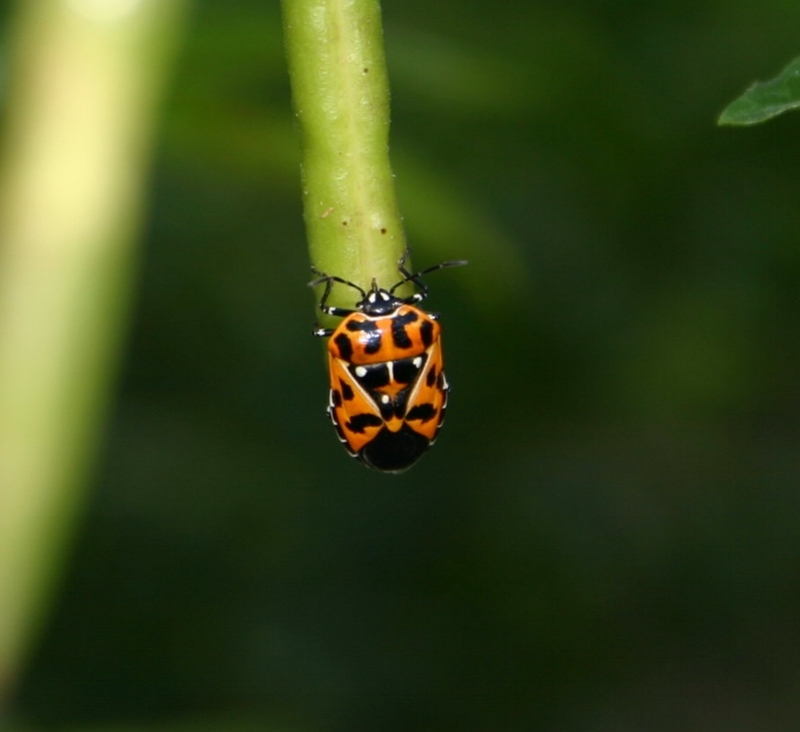 These bright orange and black insects are the gaudy cousins of the common stink bug, a fact that will not escape you should you foolishly squash one. Manual control can be somewhat effective, but a smart gardener will wear gloves to avoid a lasting stench than cannot be removed with a simple soap and water wash.
Like other stink bugs, they use a needle-like mouth to pierce plants, sucking out the juice. The damage is easy to spot – look for a light or discolored area with a tiny hole in the middle. When the damage becomes widespread, plants will wilt and entire leaves will die. Plants may become stunted. Harlequin bugs are difficult to control. A multi-pronged attack is most effective. First, be aware that adults overwinter under plant debris or fallen leaves. A good winter cleanup with fresh mulch will help. When they emerge from dormancy in spring, the females lay eggs with a distinctive appearance. The eggs look like tiny black and white barrels laid end to end, usually two parallel rows on the bottom side of leaves. Crush any eggs you find. There can be two to four generations per season. Flip the adults into a small container of soapy water, since crushing releases a nauseating smell. Insecticidal soaps or other insecticides can be used where numbers are high and plant damage is severe. Those hard shells give good protection, so multiple applications may be needed. In all cases, read product labels to ensure that you have selected an insecticide that will be effective, apply only in the concentrations specified on the label, and do not apply more often than recommended. In the Mary Snoddy garden, I have found that plant rotation is a helpful tactic. I grew Cleome in the same flower bed for a number of years. When Harlequin bugs caused extensive damage, I planted seeds in a different location. The new location was bug free for five years. I’ll find an alternate location for next year. Harlequins prefer to munch on cruciferous crops, like cabbage, broccoli, collards, kale and turnips. If those are not available, they will live on tomatoes, okra, potatoes, beans, asparagus and even fruit trees. Which is to say, they’ll eat just about any plant humans do. Row covers over vegetable crops provide a high level of protection for vegetable crops but are impractical for decorative flower beds.